There are number of excellent parking facilities all within convenient walking distance of the Von Braun Complex. If you will be driving in for the race on Saturday morning, please take a moment and review this map provided by the City of Huntsville, then carefully read the details below. If you still have questions, feel free to contact us. There are two (2) parking lots and five (5) parking garages all within easy walking distance of the Von Braun Center. Each will be listed below along with pertinent details including cost. We do encourage all runners (half-marathoners and kid’s marathoners included) to arrive at the VBC well before the start of the marathon. The Von Braun Center has an underground parking garage that offers convenient access directly into the VBC complex. The entrance is directly across from Pollard off of Clinton Ave. Drive past Lot V and down the ramp. The entrance to Garage M on race morning will be located on Church Street, but runners will be able to walk out of the garage onto Monroe and enter the VBC complex. The entrance to Lot V is off of Clinton Ave directly across from Pollard. Runners will be able to use the North Hall entrance to gain access to the VBC complex. Lot K is a large, gravel parking area with an entrance off of Clinton. It’s a short walk to the North Hall to gain access to the VBC complex. 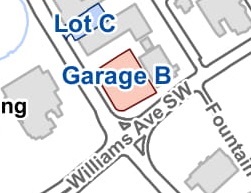 Garage B is a multi-level parking facility conveniently located on the corner of Church and Williams; however, the entrance is on Fountain Circle. Garage A is multi-level parking facility located on Fountain Circle with the entrance on Gates. Garage O is a multi-level parking facility located on Clinton Ave one block off the square in downtown Huntsville. While this may be a slightly farther walk than the other garages or lots, it is also incredibly convenient for downtown activities following the races.